On Graduation Eve, a special ceremony took place in the chapel at University Hospital. Jacqueline Gyamfi Greene, placed on bed rest due to a high-risk pregnancy, received her hood a day early, surrounded by family, friends, several classmates as well as CDM faculty and General Dentistry department staff. 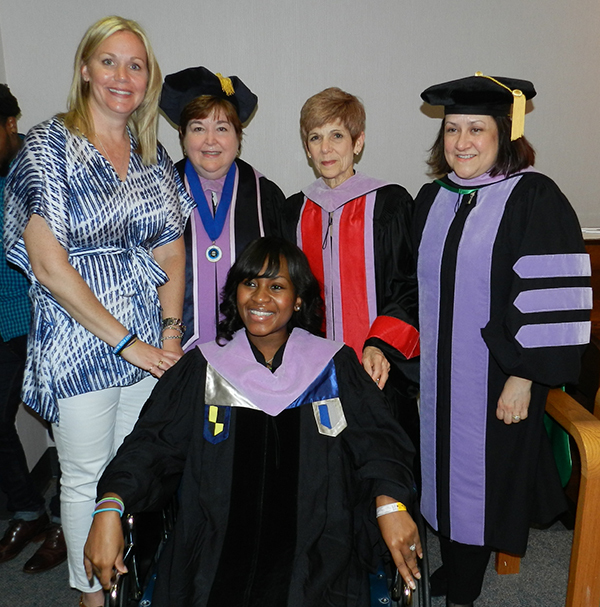 Dr. Lily Garcia, ADEA President and Board Chair and this year's Hooding Ceremony Speaker, Dean Carol Lefebvre, Dr. Carole Hanes, Associate Dean for Students, Admissions and Alumni and Dr. Kate Ciarrocca, who organized the event, all participated. Since this event was held, Jackie and her husband, Travis Greene, welcomed a new addition to their family, David Jace Greene, born June 21, 2014.